Digital technology offers a broad range of tools that can be used to enhance health care. We aim to summarize for the physiatrist use-cases of these tools in musculoskeletal self-care. Recent advances in and increasing prevalence of wearable sensors and mobile phones make these digital technologies ideal tools to help patients become active participants in their own healthcare. However, given digital health technologies’ fast-paced growth and turnover, implementation and research challenges remain. 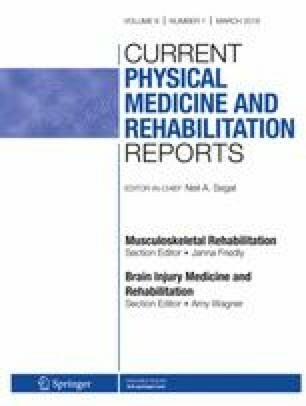 Digital technology provides novel methods to objectively evaluate patients and to engage them in active rehabilitation. Further research is needed to guide the adaptation of these emerging tools to enhance self-care of musculoskeletal conditions. Physiatrists, who have extensive experience in non-surgical management of mobility-limiting conditions, are particularly equipped to lead the efforts in the design and validation of these technologies. TMT Predictions collection| Deloitte | Technology, Media & Telecommunications [Internet]. Deloitte. [cited 2017 Oct 31]. Available from: https://www2.deloitte.com/global/en/pages/technology-media-and-telecommunications/articles/tmt-predictions-collection.html. Americans’ Internet Access:<br>2000–2015 [Internet]. Pew Research Center: Internet, Science & Tech. 2015 [cited 2017 Jan 8]. Available from: http://www.pewinternet.org/2015/06/26/americans-internet-access-2000-2015/. Althoff T, Jindal P, Leskovec J. Online actions with offline impact: how online social networks influence online and offline user behavior. ArXiv161203053 Cs [Internet]. 2016. Available from: http://arxiv.org/abs/1612.03053. Ayoade M, Baillie L. A novel knee rehabilitation system for the home. In: Proceedings of the 32Nd Annual ACM Conference on Human Factors in Computing Systems [Internet]. New York, NY, USA: ACM; 2014. p. 2521–2530. (CHI ‘14). Available from: http://doi.acm.org/10.1145/2556288.2557353. Favolla D. Home [Internet]. Muvr. [cited 2017 Nov 14]. Available from: https://getmuvr.com/. Fife E, Orjuela J. Mobile phones and user perceptions of privacy and security. 2012 Int Conf Mob Bus [Internet]. 2012. Available from: https://aisel.aisnet.org/icmb2012/23.